At about 10:05 hrs on Sunday 28 December 2014, train 1Y40, the 09:48 hrs service from London Heathrow Terminal 5 to London Paddington almost struck two construction workers who were on the Up Airport line between Heathrow Airport Tunnel and the Stockley Flyover. They jumped clear just before the approaching train struck a small engineering trolley that they had been placing on the line. 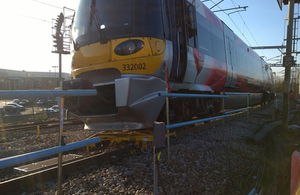 The train, formed by a Class 332 electric multiple unit, was travelling at approximately 36 mph (58 km/h) when it struck the trolley. The two track workers were among a large number of people carrying out construction work on the approach to a new bridge that had been recently constructed adjacent to the existing Stockley Flyover. This new structure, which carries a new railway track over the mainline from London Paddington to Reading, was built as part of the Crossrail surface works being undertaken by Network Rail. To enable this work to take place, parts of the operational railway in and around the construction site had been closed for varying periods during the few days before the incident. The two construction workers were unaware that the Up Airport line had returned to operational use a few hours before they started to place the trolley onto this line. They formed part of an eight person workgroup which included a Controller of Site Safety (COSS). The COSS and other group members were not with the two track workers at the time of the incident. The presence of temporary fencing, intended to provide a barrier between construction activities and the operational railway, did not prevent the two track workers accessing the open line. Network Rail owned the infrastructure at the site of the accident and had employed Carillion Construction as the Principal Contractor for the construction works. The two track workers and the COSS were all employed by sub-contractors. Our investigation will establish the sequence of events, examine how the work was planned, how the staff involved were being managed and the way in which railway safety rules are applied on large construction sites adjacent to the operational railway. It will also seek to understand the actions of the people involved, and factors that may have influenced their behaviour. We will also consider whether there is any overlap between this incident and the factors which resulted in an irregular dangerous occurrence at the same construction site on the previous day. This occurrence involved a gang of railway workers who walked along a line that was open to traffic, and without any form of protection, until other construction workers warned them that the line was open to traffic. Our investigation is independent of any investigations by the safety authority or the police. We will publish our findings at the conclusion of the investigation. This report will be available on our website.